Few months back, we rolled out Push Notification service to keep you updated on every deal that we post. With your support, our efforts paid off and it was well received by you guys. So, firstly we’ll like to thank you for that. We at AllTrickz always try to find out different ways to make your experience with us easy, simple and such that you never miss a deal. Therefore, we have come up with another new service to keep you updated with the best online deals available, using the feature-rich cloud based instant messaging platform – Telegram. Read on to know how it works and how can you connect with us. 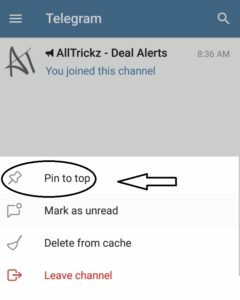 How to Join AllTrickz – Deal Alerts channel? 1. First of all, download Telegram from here – Android | iOS (if you don’t have it yet) or visit telegram.org to download desktop version. 2. Open the app and complete the sign-up/login process using your mobile no. 3. 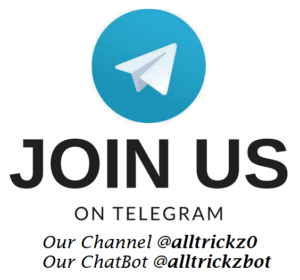 Now, search for “@alltrickz0” in Telegram app or click this link – telegram.me/alltrickz0 on your browser to get to the channel >> click on JOIN. 4. Done!!! You’ll now get a notification every time we post a deal. 5. Make sure you never click on MUTE button otherwise you won’t receive any notification for our messages. 6. Also, go to Telegram homepage & long press on channel’s name & click on ‘Pin to Top’ so that you will never miss any alert if there are a lot of chat boxes. 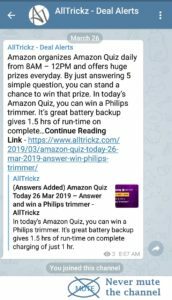 What will you get on AllTrickz – Deal Alerts channel? 1. Instant alerts for all the best loot deals. No SPAM. 2. Handpicked deals of the day at one single place so you don’t miss any. 3. Deal alerts on your mobile as soon as they are posted. No time lag. 4. Exclusive contests and giveaways for our Telegram users. 5. Access to deals that might vanish in seconds – Get them on our Telegram channel before they are posted on website. 6. Feedback and Opinion Polls – Let us know what you feel so we can serve you better. 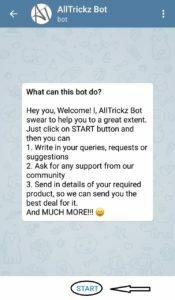 Meet our AllTrickz Bot & know how to use it? 1. Have any queries related to an offer/deal or suggestions on our service? 2. 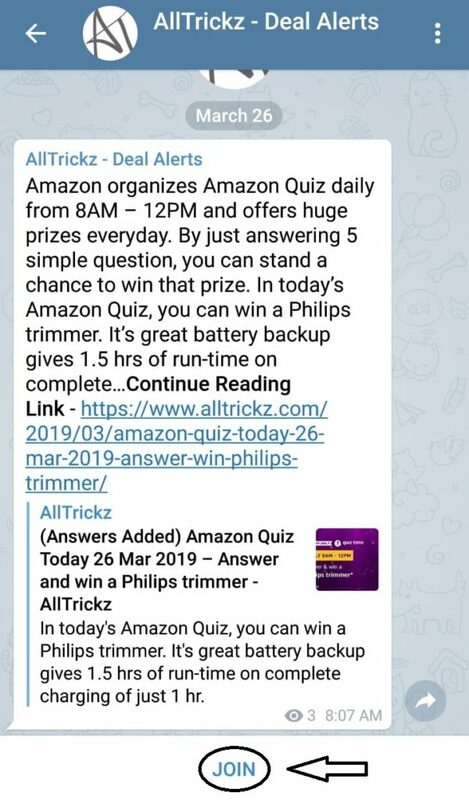 Search for “@alltrickzbot” in Telegram app or click this link – telegram.me/alltrickzbot on your browser to get to the bot. 3. You will then get to our chatbot. Click on START there. 4. Done!!! It’s as easy as talking to a friend over chat. You can write in your queries & we’ll respond soon. 5. You can also send in product details or any service that you want to avail and we’ll send you the best deal for it. 6. So, join now and talk to us. Our community will always be available to support you. Privacy – Telegram messages are heavily encrypted and can self-destruct. Unlimited members can be added to a Telegram channel. Instant notification of posted deals. Telegram is very convenient and really easy to operate. >> Any doubts or suggestions on getting instant alerts? Feel free to post it in the comment section below.